An impressionable boy named Tony Delmonte lives in a seemingly typical American suburb until he sneaks out of his room one night and becomes entangled in a horrific plot involving summer camp murders and backyard burials. While Conan's army celebrates their defeat of the fearsome Picts, an enemy alliance assails the crown city of Conan's kingdom. Even Conan's prowess is not enough to lead his outnumbered and depleted legions to victory against these new adversaries, but an alliance with his homeland is possible, but only if Conan can defeat the mighty Cimmerian chieftain - in a battle to the death! 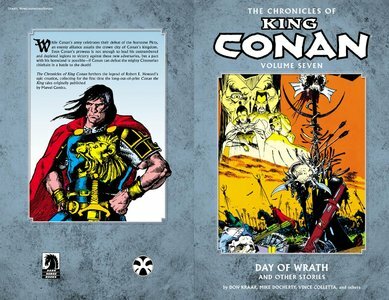 The Chronicles of King Conan furthers the legend of Robert E. Howard's epic creation, collecting for the first time the long out-of-print Conan the King tales originally published by Marvel Comics. The Geldarians are a race of incredibly intelligent, yet physically weak and fragile beings. To compensate for their frailty they have invented the "Tech Jacket," a vest that every Geldarian is equipped with upon birth. Each jacket grows and matures with its host, specializing in tasks that the host will find most useful. A fully developed Tech Jacket is considered to be one of the most powerful weapons in the universe. 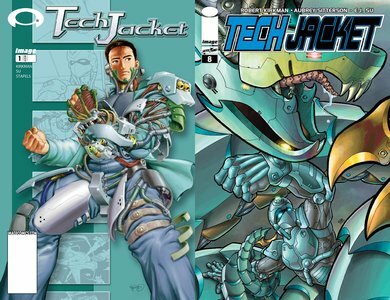 Zack Thompson, through an event of sheer chance, has come to possess a Tech Jacket of his own. Now it appears that the fate of the entire universe rests on his shoulders as he learns that with infinite power comes infinite responsibility. Months ago, the war between the Amazons and the Atlanteans escalated and spilled over into the rest of the world after Emperor Aquaman submerged Rome underwater. 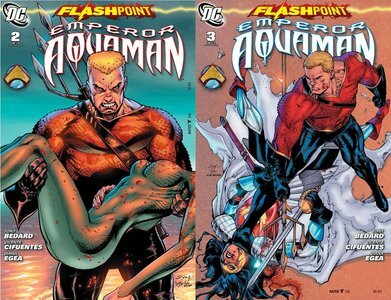 Now, learn the truth behind one of the biggest events in the world of FLASHPOINT. 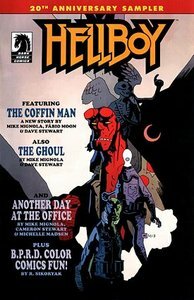 This Saturday, March 22, is Hellboy Day, with Dark Horse Comics celebrating the 20th anniversary of Mike Mignola's surprisingly everyman demon with a number of events across the country (and, indeed, the world) and a special 20th anniversary sampler featuring new work by Mignola and other creators -- and The Hollywood Reporter has an exclusive preview of New Yorker cartoonist R. Sikoryak's contribution. Rick. Ezekiel. Gregory. Negan. Each man holds the fate of their community in their hands... and WAR is on the horizon. 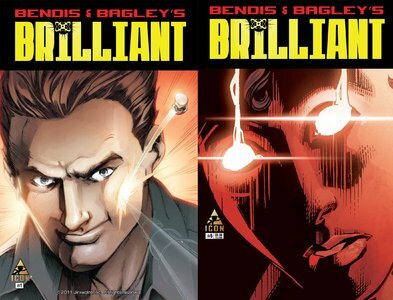 Marvel UK's greatest heroes come together for the first time in 20 years to face a threat that could destroy the world. Featuring Captain Britain, Pete Wisdom, Death's Head II, Motormouth and Killpower, the Warheads and a host of British heroes. When Shevaun Haldane experiences a troubling vision in Darkmoor Castle, she realizes danger may be coming for the heroes of Marvel UK. With time running out, Shevaun has no choice but to suit up as Dark Angel once again. An adventure that will take fans through the past, present, and future of Marvel UK! REVOLUTIONARY WAR PART 3 - A corporate deep-mining setup unearths an old MYS-TECH base, where magical cloning experiments have been taking place. What mysteries or monsters are waiting in Britain's subterranean bones? Guri is a beautiful human-replica droid, and the personal assassin for the leader of the Black Sun criminal organization. 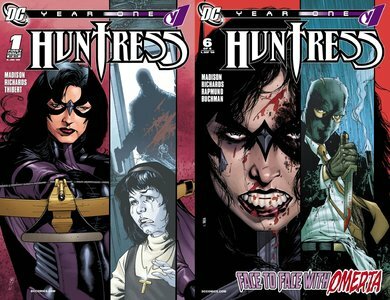 When Black Sun is destroyed, this bounty hunter herself becomes the target of a team of bounty hunters determined to obtain the valuable android, and mine the secrets of her mind. 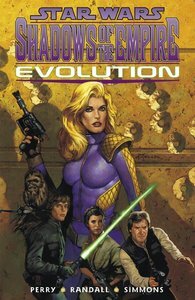 Evolution is the sequel to the best-selling novel Star Wars: Shadows of the Empire, and marks best-selling Shadows novelist Steve Perry's first foray into the world of Star Wars graphic novels. 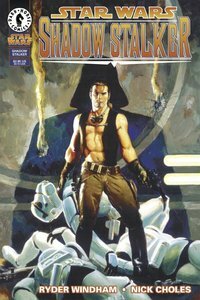 Star Wars: Shadow Stalker. 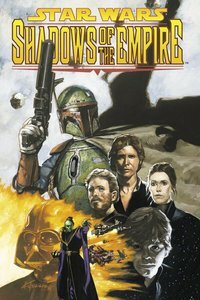 A Shadows of the Empire Story. Originally printed in Topp's Star Wars Galaxy magazine, issues 9-12. WINNER OF THREE EISNER AWARDS. Accompanied by his mischievous monkey and the mysterious Agent 355, Yorick embarks on a transcontinental journey to find his girlfriend and discover why he is the last man on Earth. This volume finds Yorick, Agent 355 and Dr. Mann traveling across the Pacific to Japan in pursuit of Yorick's stolen monkey Ampersand, whose innards may hold the key to mankind's future. 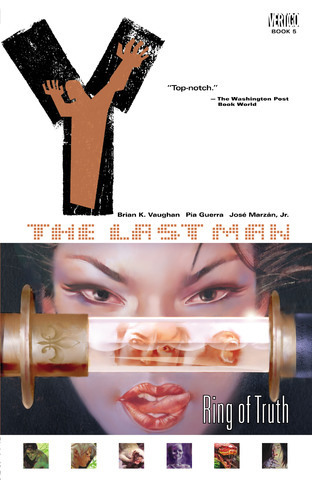 Collects issues #32-36 of the runaway hit Vertigo series by Brian K. Vaughan (EX-MACHINA, ASTONISHING X-MEN, RUNAWAYS) and Pia Guerra. 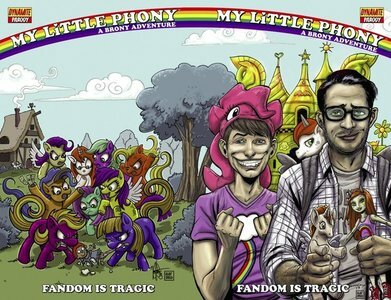 WINNER OF THREE EISNER AWARDS. 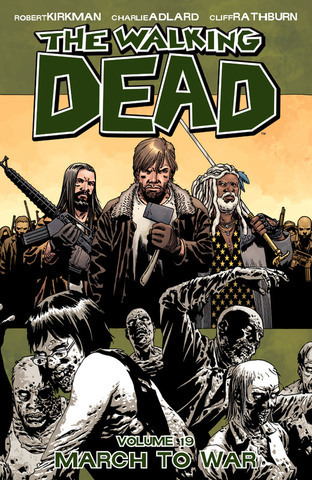 Yorick Brown, the last man on Earth, finally makes it to San Francisco where his unbalanced sister, Hero, finds him seemingly succumbing to the male-killing plague after losing his still-unused engagement ring to the burqa-clad agents of the Setauket Ring. But is the ring really the key to his survival? And what does it have to do with the mysterious Amulet of Helene, which the Setauket leader is determined to take from Agent 355 by any means necessary. Collects issues #24-31 of the runaway hit Vertigo series by Brian K. Vaughan (EX-MACHINA, ASTONISHING X-MEN, RUNAWAYS) and Pia Guerra. WINNER OF THREE EISNER AWARDS. 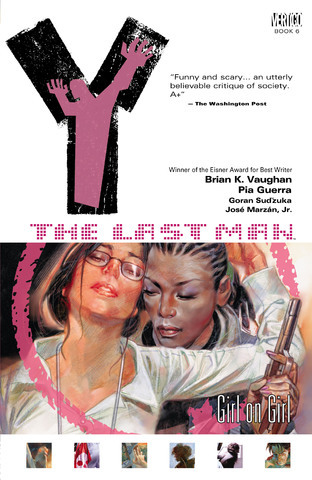 Featured in THE NEW YORK TIMES and on NPR, Y: THE LAST MAN is the gripping saga of Yorick Brown, an unemployed and unmotivated slacker who discovers he is the only male left in the world after a plague of unknown origin instantly kills every mammal with a Y chromosome. Accompanied by his mischievous monkey, Ampersand, and the mysterious Agent 355, Yorick embarks on a transcontinental journey to find his long-lost girlfriend and discover why he is the last man on earth. 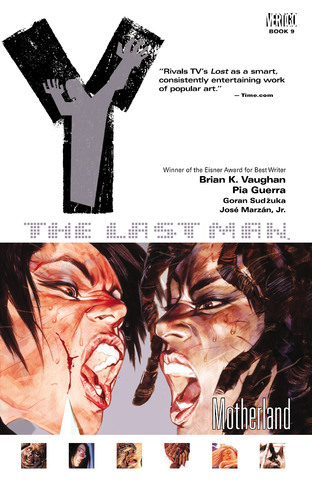 This volume of the critically acclaimed series features Yorick and Agent 355 preparing for their ultimate quest to reunite the last man with his lost love, while the person, people or thing behind the disaster that wiped out half of humanity is revealed! 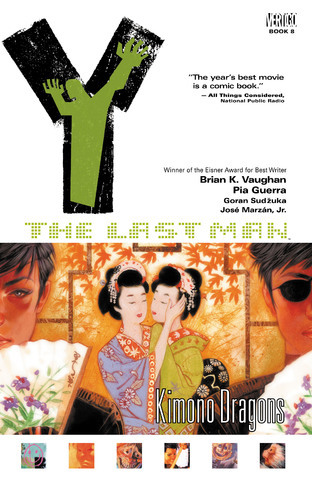 Collects issues #49-54 of Brian K. Vaughan and Pia Guerra's award-winning Vertigo series. WINNER OF THREE EISNER AWARDS. 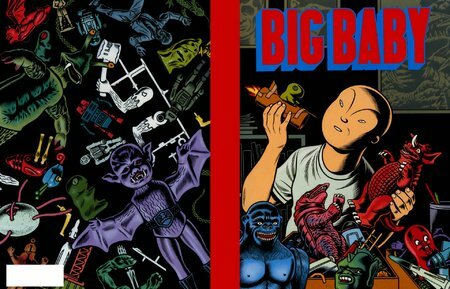 KIMONO DRAGONS brings the hunt for Ampersand--the monkey who could unlock the mystery of the male-killing plague-- to its explosive climax, as the last man on Earth and his companions finally reach Japan and discover the truth behind Ampersand's abduction. 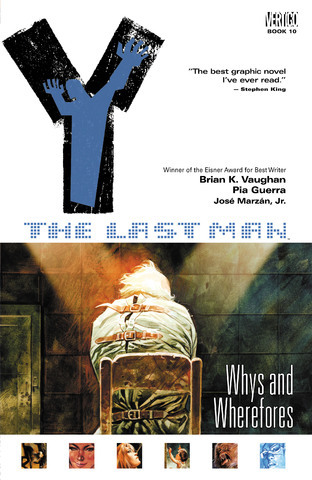 Collects issues #43-48 of Brian K. Vaughan and Pia Guerra's award-winning Vertigo series.